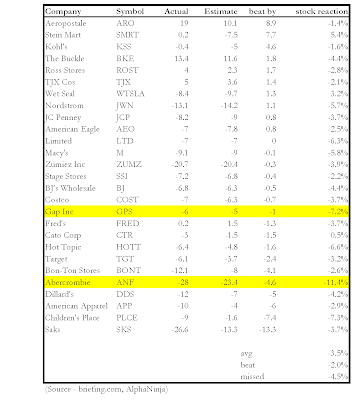 AlphaNinja - Retailers reported Same-Store-Sales figures (Sales at stores that have been opened at least a year, to exclude new store openings from organic growth). On average the numbers were -6.8%, and they missed street expectations by 74bps. Getting hit the worst this morning are the Gap and Abercrombie. The sales figures do not usually discuss markdown activity, which has a major impact on margins.